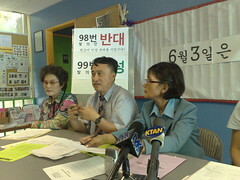 Korean Americans say NO to Prop 98! Rent Control, Affordable Housing and Tenant Rights Upheld! (Los Angeles, CA) Community members celebrated last night with the defeat of Prop 98, a ballot measure that would have ended rent control, affordable housing development and tenant rights. 60.9% voted no on Prop 98, while Prop 99, a counter ballot to Prop 98, passed with 62.4%. This is a significant victory for low-income and working class families that rely on rent control and affordable housing to survive in the current economic climate of house foreclosures and sky-rocketing gas and food prices. · Of the 4,813 registered Korean American voters who were phone-banked in May, 92% said they were going to vote on June 3rd and 89% said they would vote no on Prop 98, with 90% saying they would vote yes on Prop 99. · Of the 1,897 homes visited, 90% of voters contacted stated that they would be voting on Election Day, 98% said they would vote no on Prop and 96% said they would vote yes on Prop 99. “Prop 98 deeply energized the Korean American community. There was a real fear from many of our working families and immigrant seniors of what would happen if Prop 98 passed and they channeled that fear into action, voting on Election Day and spreading the word among their friends and family members. And many young Korean Americans came to KRC to phone bank because Prop 98 hit home for them. We heard from many Korean American voters during the weeks leading up to June 3rd who told us that they had not planned on voting but became determined to be heard and defeat Prop 98. Our community came together and mobilized to beat Prop 98, and we are proud to stand alongside them to celebrate its defeat,” said Eun Sook Lee, Executive Director of NAKASEC. “Our work in promoting the civic participation of Korean Americans and fighting for issues important to our community does not end on June 3rd. We must continue this momentum in the months leading to November and beyond because civic participation is not limited to elections; it is an integral part of our identity as Korean Americans,” said Hee Joo Yoon, Program Director of KRC. Since December 2007, KRC’s Power Vote has been meeting monthly to learn about the civic process and the issues that are important to the Korean American community. The precinct leaders discussed ways to increase the civic participation of Korean Americans in Los Angeles and Orange County and was vital in KRC’s 2008 electoral work. To get involved, please call KRC.